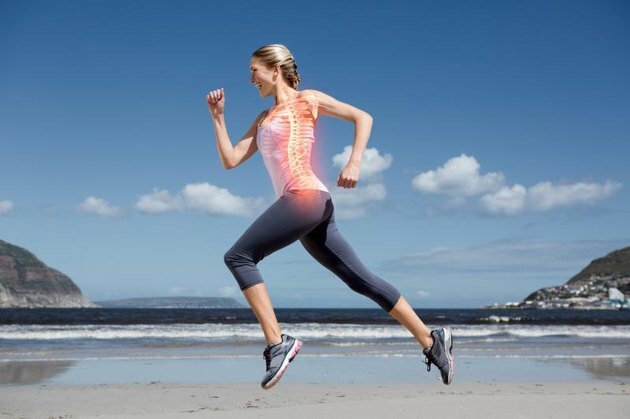 A healthy spine naturally rounds at the top and arches at the bottom. But too much rounding signals that something is off. If you're older and female, osteoporosis may be to blame. If you're younger, it could be your posture. Too much slouching -- for example, sitting hunched over a desk all day -- can cause the shoulders to pull forward and the thoracic curve to become more pronounced. Although the effects of a rounded upper back usually aren't serious, it can cause stiffness and back pain. It also affects your appearance, making you look older than you are. Doing exercises to strengthen your back muscles and lengthen your chest muscles will help correct a rounded posture. This deceptively simple exercise improves thoracic extension, which is necessary for good posture. It also opens the chest muscles. Use it both as an activation and lengthening exercise and as a test to measure your progress over time. Stand with your back to a wall. Press your entire back -- upper, middle and lower -- into the wall. Step your feet a few inches away from the wall, and bend your knees slightly. Bend your elbows and press the backs of your hands into the wall at head height. Contract your core muscles and slide your hands up the wall as far as you can without your lower back arching off the wall. Slide your hands back down the wall, then repeat, attempting to reach a bit higher with each repetition. 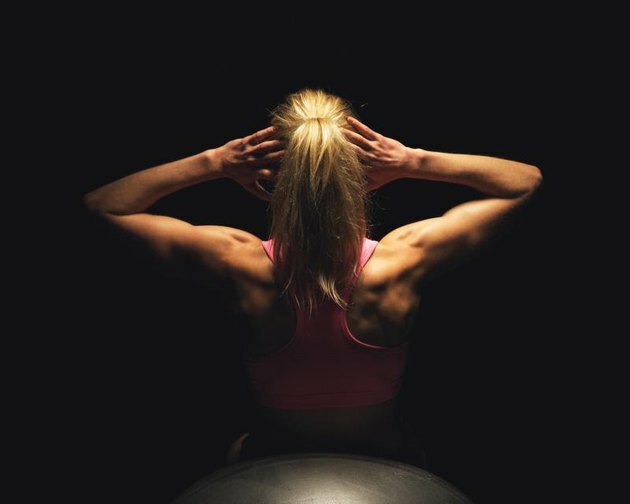 You don't need to lift heavy weights to develop the upper back strength needed for good posture. This simple band exercise activates your back and improves scapular retraction to help the shoulders stay back and down instead of rounding forward. Stand with your feet hip-distance apart. Grab an exercise band with both hands about shoulder-width apart and extend your arms out in front of you. Pull your shoulders back and down and contract your core muscles. Slowly open your arms out to the side, squeezing your shoulder blades together. Bring your arms as wide as you can without shrugging your shoulders or bending your arms. Adjust the tension of the band if necessary. With control, bring your arms back to the starting position. Repeat. Using your own body weight, inverted rows help build back strength and improve scapular retraction. You can do them with a suspension trainer or with an empty barbell in a squat rack. If using a suspension trainer, grab the handles with your palms facing in toward each other. Walk your feet forward so that your body is at an incline. The farther forward you walk your feet, the harder the exercise will be. Extend your arms and contract your abs. Balancing on your heels, bring your body into one straight line. Pull your shoulders back and puff your chest out. Begin to bend your elbows as you pull your chest toward your hands. Squeeze your shoulder blades together, and don't allow your back to arch or your hips to sag. Slowly straighten your elbows to come back to the starting position, then repeat. To perform inverted rows using a barbell and squat rack, position the barbell about arm's distance from the floor. Lie on the ground on your back with your chest underneath the bar. Reach up and grasp the bar with your hands shoulder-width apart. Contract your core, glute and leg muscles, and pull your shoulders back. Pull with your arms and bend your elbows as you bring your chest up toward the bar. Keep your body in one straight line from your shoulders to your heels. Hold at the top for a second and then lower back down almost all the way to ground. Repeat. If this is too challenging, raise the height of the bar and walk your feet back so that your body is more horizontal rather than vertical. Adjust your positioning to make the exercise challenging, but not so hard that your hips sag or your back arches. Tight chest muscles pull the shoulders forward, creating a rounded appearance. This easy standing stretch can be done almost anywhere. Stand perpendicular to a wall about arm's distance away. Place the palm of your hand on the wall at shoulder height with your fingers pointing backward. Step your inside foot a few inches forward and rotate your body away from the wall to initiate the stretch. Keep your arm straight and your abs contracted. Hold the stretch for 10 seconds and release. Repeat on the other side. Redefining Strength: Thoracic Extension Exercises – The Thoracic Bridge And More!